We're returning back to our lessons with a different approach after break. We're implementing The 12 Week Year. If you aren't familiar with the 12 Week Year, it is a book and system that empowers you to approach goals twelve weeks at a time. versus stretching them over the course of a year. I like the idea because I tend to either accomplish my goals sooner and long before the year is over or lose some interest. In our homeschool, we tend to stretch things out a bit more or not move with a sense of urgency in some areas. This approach doesn't always allow us to complete all things we want to complete. I don't believe that homeschool families should rush through lessons simply to get them done and check them off of the list, but I do believe in having some sense of urgency for certain things. Now that my daughters are older and have started to create their own goals for their education, I can see how implementing the 12 Week Year will be a good method for our homeschool. Part of the system is creating goals. The goals should be aligned with the vision we have for our daughters' education so before we could create goals we needed a good sense of the result we're desiring to achieve. After reflection, my daughters and I created a few goals for the upcoming 12 weeks. The idea is not to have 50 bajillion goals, but to have three or so solid goals to work towards during the time frame. My oldest daughter shared two goals, and my youngest had one. As the parent, I can see areas that they need to work on so I had a goal for each of them which fit nicely with the goals they came up with for themselves. Creating the goals can be easy enough if you don't overload the list. Execution can be a different beast though. In order for us to come up with a plan to execute the goals, I had to sit down and honestly look at my responsibilities outside of homeschooling. I wrote down everything that takes time from my day. I placed limits on some things, and I cut out other things that aren't important during this 12 weeks. I have to remind myself that we are only focusing on 12 weeks at a time so we can always make a shift later. This is important for me to remember because sometimes I want everyday to be the same so that I won't have to readjust. One of my daughters also struggles with this, but we all know that rarely are two days the exact same even when we do follow our routines. After looking at my responsibilities, I created time blocks. This important because it is usually the lack of time management that hinders us from reaching our goals. I either don't have a realistic view about how much time a task will take or lessen the value of the task-- pushing it off until. After creating time blocks specifically for our homeschool, I shared it with my oldest daughter. I needed her approval. She's getting to the age where she really wants to own her education and push herself more. I can say one homeschooling goal I have has been achieved, and that is having daughters who are engaged in their learning. Now that we know when and what we'll work towards, we had to figure how we would achieve our goals. Now, we aren't switching curriculum to meet math goals or anything like that but, we are removing some subjects from our course of study during this 12 weeks so we can intentionally focus on the lessons that are part of the goals. Before starting back I decided that we would focus only on four subjects each day. I asked my girls which subjects they wanted to focus on outside of math and language art for this 12 weeks. My oldest requested history and art history, and my youngest requested music. I took the list of our subjects and created the schedule below. I made this schedule in Publisher with fonts I downloaded. I really like fonts! As the facilitator, I have to make sure that we have a weekly plan to help us execute our goals. I will write our lessons before the beginning of each week more than likely on the Friday before. In my homeschool planner, I focus on writing the lessons we will do together and notes to guide me in helping my girls reach their individual goals. My daughters also have student planners. I write out the independent lessons for my 10 year-old daughter, but my 13 year-old writes her own lessons down. I dictate the lessons and expectations to her. We use a simple one page planner style for each week to keep track of the girls' lessons. This allows space for just the information they need and keeps me from overloading their week. By writing our lessons, printing resources, or gathering books in advance, we will be able to execute the steps needed to achieve our homeschool goals. 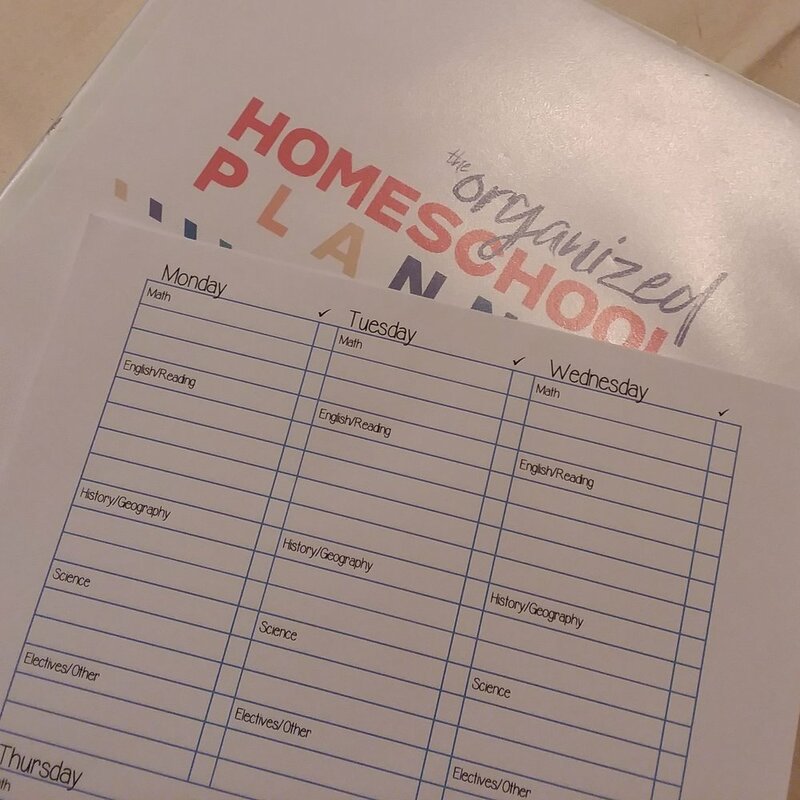 These are downloadable planners for homeschool parents and students. Have you heard of The 12 Week Year ? How do you approach homeschooling?